Assistant District Officer of Kudat, Encik Mohd. Salleh Haji Aliakhbar (far right), presenting the ‘bokashi’ to Mr. Richard Teo, Hotel Manager of Kudat Golf & Marina Resort (far left), during the launch of Kudat Environmental Week. Also present are Environmental Action Committee Finance Manager, Miss Helen Erut (2nd from the left) and Mrs. Francesca Winfield, Director of Kudat Turtle Conservation Society (3rd from left). Kota Kinabalu – Assistant District Officer of Kudat, Encik Mohd. Salleh Haji Aliakhbar, launched Kudat Environmental Week, which is being held in conjunction with Malaysian Environment Week. This event is the first of its kind being held in Kudat. 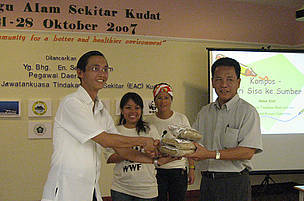 Coordinated by WWF-Malaysia and Kudat Turtle Conservation Society (KTCS), this week-long event is focused on creating awareness of the marine and coastal environment in Kudat. The overall theme, ‘Kudat Community for a Better and Healthier Environment’, empowers the people of Kudat to be responsible over the environment. Kudat Turtle Conservation Society Director, Mrs. Francesca Winfield said "Kudat has so much to offer including the unexplored reefs off Bak Bak Beach, the limestone caves of Balambangan Island, the long stretches of white sandy beaches on Maliangin Island, and, the strong traditions of the Bajau Laut fishermen. Unfortunately, many tourists (both local and foreign) do not venture any further than the tip of Borneo when they head north." Encik Salleh said in his speech how special the marine life in this area is in terms of its biodiversity content. More than 550 species of fishes and 250 species of corals can be found in the Kudat-Banggi area. This area also acts as a migration route for whale sharks, dolphins and sea turtles, proven by the whale shark that was found in Marudu Bay in August. By emphasizing this, Encik Salleh says it is clear why the environment must be protected. This can be achieved by applying proper waste management, such as recycling and composting. Miss Helen Erut from Environmental Action Committee (EAC) explained the concept of organic waste management. For food and kitchen waste management, she introduced a new technology which requires the use of a composting bin and ‘bokashi’ (fermented organic matter, in Japanese). The technique is simple, and results in dry waste (used for composting), and concentrated liquid which can be used as a fertilizer, or, to prevent algae build-up. Helen said that composting is an effective way to manage waste. According to statistics, 10% of waste in Malaysia currently ends up in rivers and oceans, which ultimately threatens marine life. This has an effect on the number of fish in the sea – the main source of income for many people in Sabah. To promote waste management in Kudat and in conjunction with Kudat Environmental Week, Kudat Golf & Marina Resort is implementing a Pilot Project on Food & Kitchen Waste Composting using this technology. The launch of Kudat Environmental Week was attended by representatives from the public and private sectors and NGOs, including Sabah Parks, Department of Fisheries, St. Peter Secondary School Kudat, Kudat Golf & Marina Resort, Kudat Golf Club, Puspanita, Kudat Fire Brigade, Kudat Hospital, Kudat Library, District Office of Kudat, and the Buddhist Association. Other activities that will be held this week include a week-long exhibition at the Kudat Library, an awareness seminar on ‘Conservation of Natural Resources’ (Saturday, 27 October 2007), and a beach clean-up & football match at Bak Bak Beach (Sunday, 28 October 2007).